As decorating luck would have it, the summery, beachy striped throw pillows I chose to go with our new couch when we first moved to Seaside last January do not in any way go with the way I actually decorated our home. 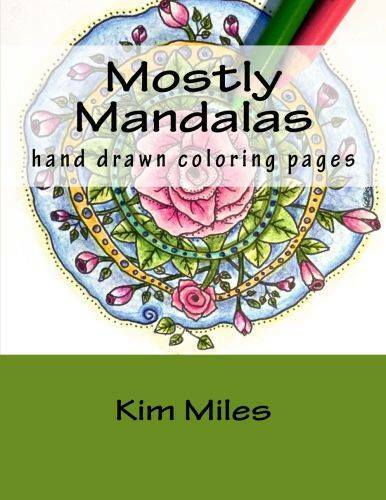 We're more bohemian than coastal, more comfortable than cute, and our colors are deeper and richer than the popular whitewashed look we see so much of. I ended up draping throws and kantha quilts over the white couch, but those dumb striped throw pillows were just sitting here mocking my snappy decision making skills. The size and firmness of the pillows is perfect, so I didn't really want to replace them. Covering them was the obvious solution, but I hate to sew, even though I love my great grandmother's black iron Singer in its curved wooden case. It works, but I avoid using it as much as possible, which is most of the time. 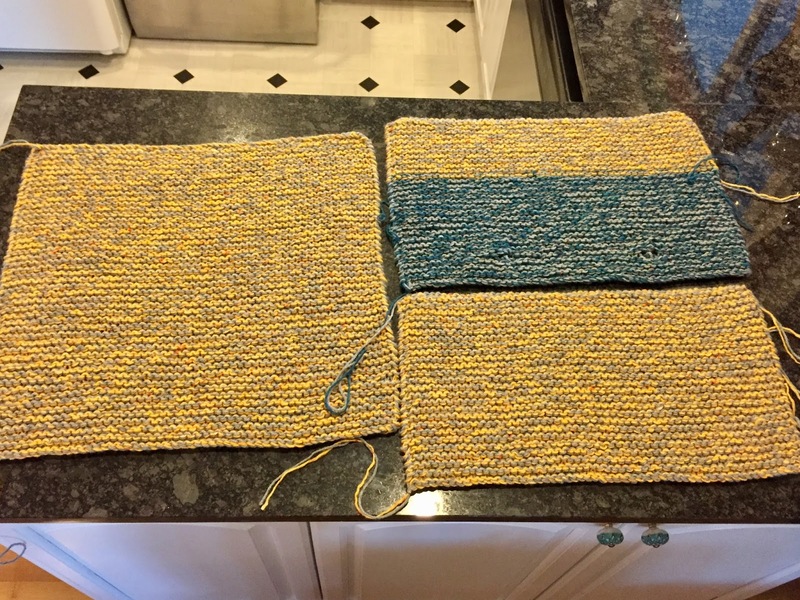 The solution, of course, was to knit new covers. Our house is starting to look like a herd of creative spiders got loose in here and covered everything in webs of yarn. OK, it's not that bad, but it's pretty apparent that a knitter lives here. 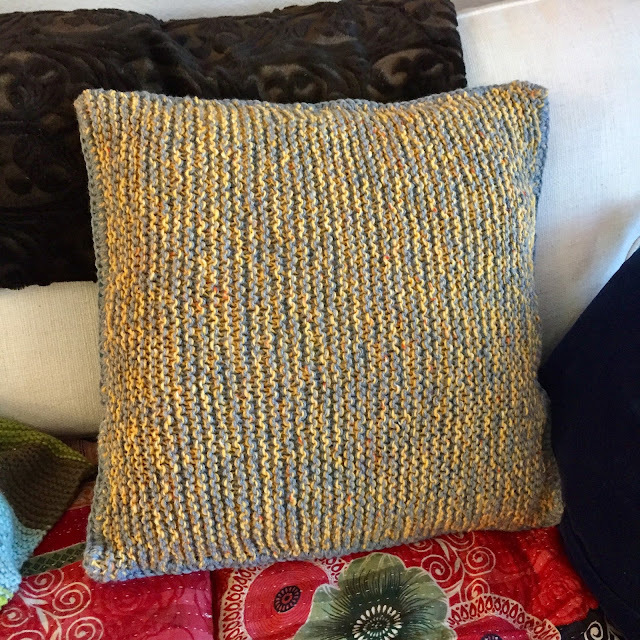 I was resisting adding another layer of knitted home decor, but when my niece gave me two huge balls of wool yarn her friend had lugged back from Ireland (I might be making that part up), I suddenly felt inspired to fix those darn throw pillows. The first one is finished, and the second one is in the works. The knitted cover is so much better than the perky little pinstripes, perfect as I thought they would be before I knew what this house really wanted. And why is the new cover called the Danny Kaye Pillow? I was sitting here watching White Christmas (I started the pillow and the post before Christmas...), this yellow yarn on the table next to me, waiting to see what it would be used for. There's a scene in the movie where Danny Kaye fakes a fall down the stairs, and is sitting there with one leg in the air, moaning in faux pain, with his lovely yellow socks sticking out beneath his gray pants. I was smitten - not by Mr. Kaye himself so much as by the color combination he was wearing. 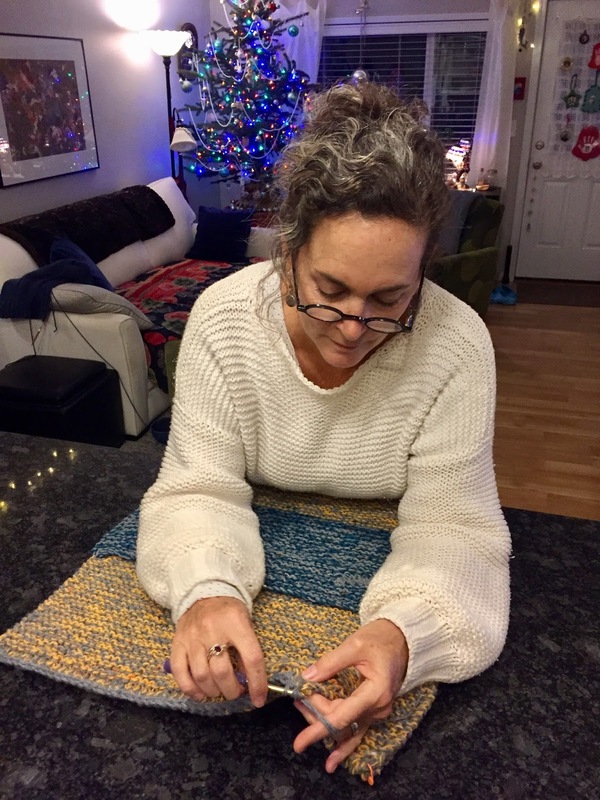 I had a lot of gray yarn left from my Big Reader's Wrap, so I decided right then and there, before Danny had even limped out the front door with General Waverly, to make a gray and yellow pillow cover. 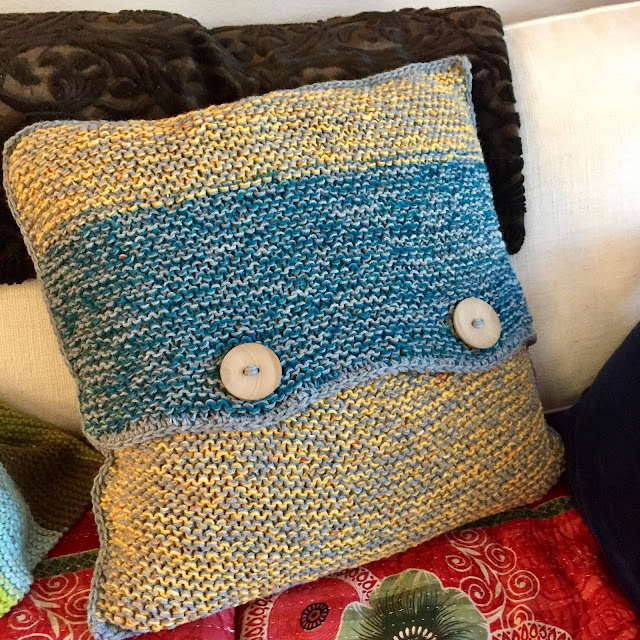 When I ran out of yellow, I switched to the green wool with the gray for what I thought was going to be the back of the pillow. Once I got it all put together, I liked it so much it became the front. 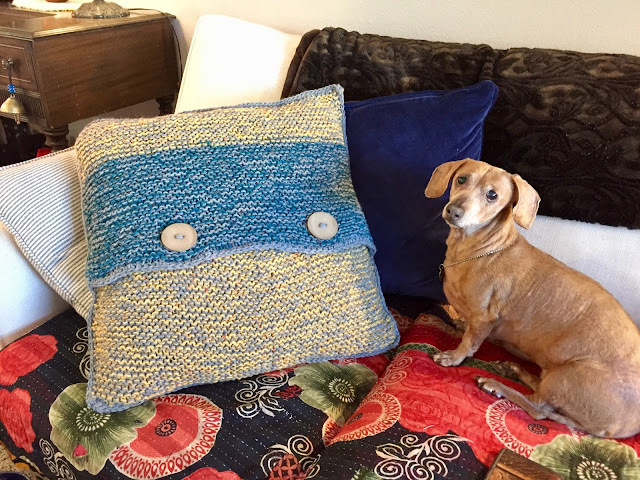 I don't think I can really write a pattern for this, but I can give you some general guidelines. 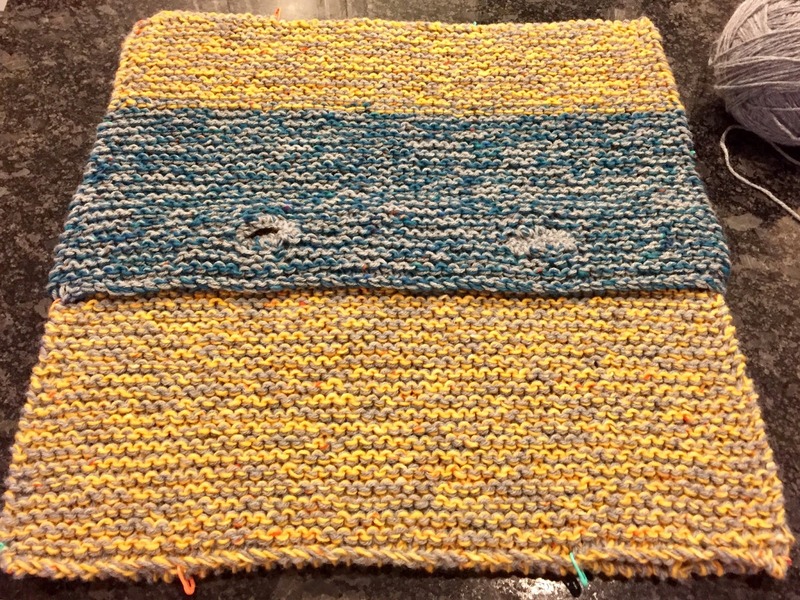 Starting with the measurements of my pillow, 21 x 21 inches, I did a gauge swatch with my two strands of yarn on size 13 needles. I got about 11 stitches to 4 inches, so estimated 57 stitches as a good number to cast on. Knitting in garter stitch, I made a big square for the back, and two rectangles for the front. The rectangles overlap about 3 inches, and the top one (the green one) has two buttonholes worked into it. I don't think I did the buttonholes right, so I cleaned them up with a little crocheted edge. There are lots of helpful videos online to show you how to make a tidy buttonhole. I'll be paying closer attention next time. Once all three pieces were made, I laid them out on the counter and "pinned" them in place with stitch markers. 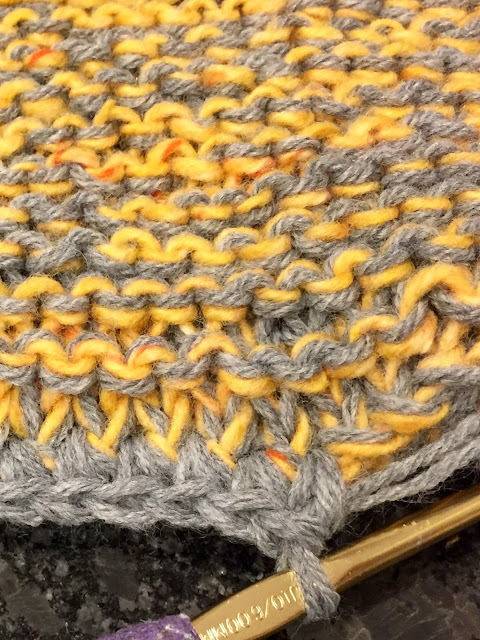 Then I took two strands of the gray yarn and crocheted the edges together in single crochet. 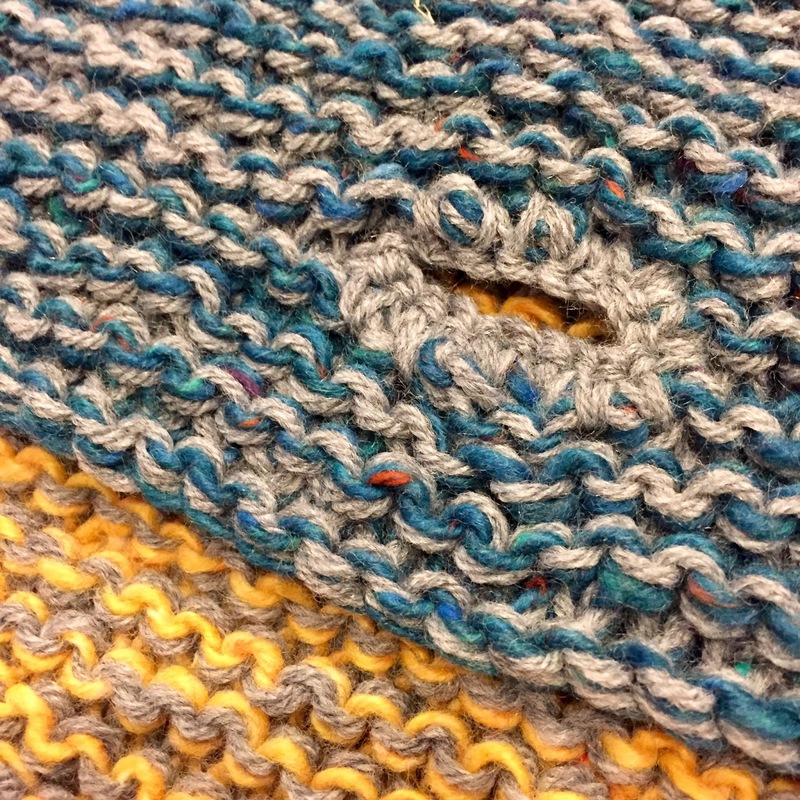 I added a crocheted edge to the green panel, below the buttonholes, for a neater finish. And last of all, I sewed on the great big buttons. The whole thing only took about 3 days to complete. One more pillow to cover. Bye-bye perky stripes! Bohemian, all the way! Love your decorating style. If you start knitting toilet seat covers, I'll worry. Otherwise, keep on knitting! :-)) How 'bout a little boho outfit for Heidi?